This view depicts a mill that belonged to John Constable's father. You can see the sluice and lock gate on the River Stour, and the tower of Dedham church. It is based on an oil sketch, one of several versions of the composition. This is the third and last version of the subject, and represents Constable's final thoughts about the subtly orchestrated composition. It is one of the artist's most beautiful and justifiably famous pictures. 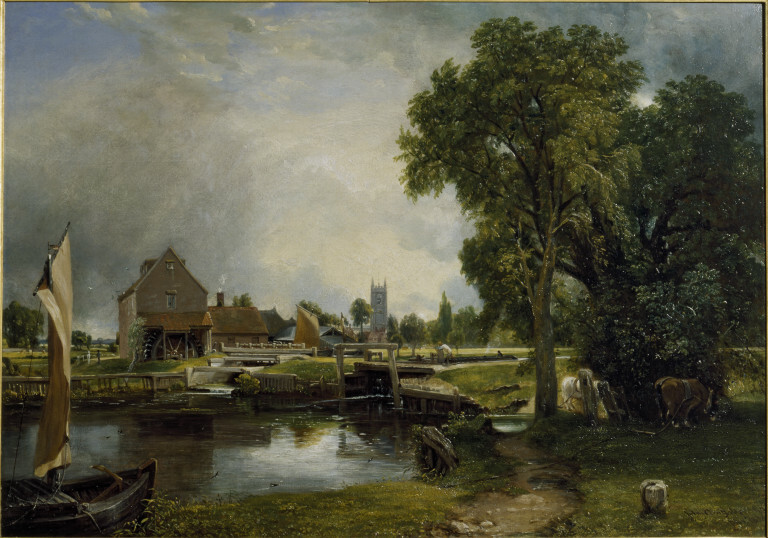 Constable's father owned Dedham Mill, and he worked there as a boy, on and around the river Stour. The sun is just breaking through the rain clouds after a shower, the grass and foliage glistening brightly in the light. Such effects were Constable's forte, and the principal aim of his life and work. But together with his observation and recording of the 'real' atmosphere of landscape, there co-existed the fervent expression of his emotions about the countryside of his earliest years which resulted in his predominant place in the history of Romantic art. He himself wrote: 'Painting is for me another word for feeling, and I associate my "careless boyhood" with all that lies on the banks of the Stour; these scenes made me a painter, and I am grateful'. In 1820 Constable exhibited at the Royal Academy 'Stratford Mill' (now in the collection of Sir Reginald Macdonald-Buchanan) and 'A View of Harwich Lighthouse' (see No. 142 [302-1888] above). He stayed with Fisher at Salisbury in July and August, settled his wife and children at Hampstead by 1 September, and paid a brief visit to Malvern Hall. 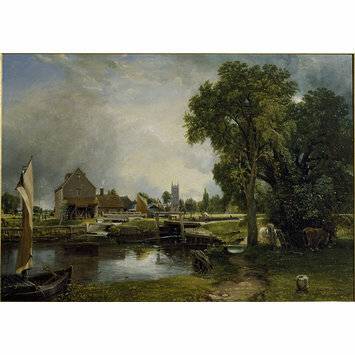 Oil painting entitled 'Dedham Lock and Mill' by John Constable. Great Britain, 1820. Parris, Leslie and Ian Fleming-Williams, Constable London : The Tate Gallery, 1991. ISBN 1854370707 / 1854370715. 544 p. : ill. (some col.). Evans, M., with N. Costaras and C. Richardson, John Constable. Oil Sketches from the Victoria and Albert Museum, London: V&A, 2011, p. 21, fig. 15.